There are more than 270 types of cobras in the world, and one of the most famous species is the spitting cobra. Spitting cobras are venomous snake species from the Elapidae family. They are found in tropical landscapes, such as those found in Africa, Australia, and Asia. They have the ability to spray venom from their fangs to defend themselves against predators but this is not used to obtain food. Their name is actually a semi-misleading one, as spitting cobras do not actually spit venom out, but they spray venom onto the eyes of its predators. This venome is harmless to skin that is not cut, but it can cause permanent blindness if it is left untreated. Unlike the spray type of venom, the venome through their bite can cause death. Spitting cobras spray venom out in a distinctive geometric pattern. The venom is thrown out from the glands as a result of muscular contractions. These specialised muscle contractions squeeze the glands, forcing the poison out through the tips of its fangs. When the venom comes out, the spitting cobra is forced to expel a large gust of air from its lungs. This gust of air scatters the venom in an aerosol-like form, and thros its towards the predators’ face, especially the eyes. 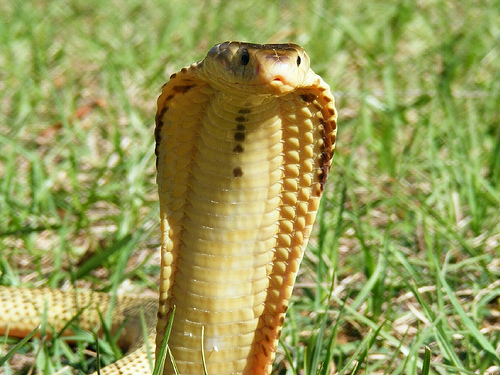 It has been discovered that some of these spitting cobra snakes can spray venom as far as 2 meters! Spitting venom is their primary form of defensive action, and their bite is a secondary form of defense. 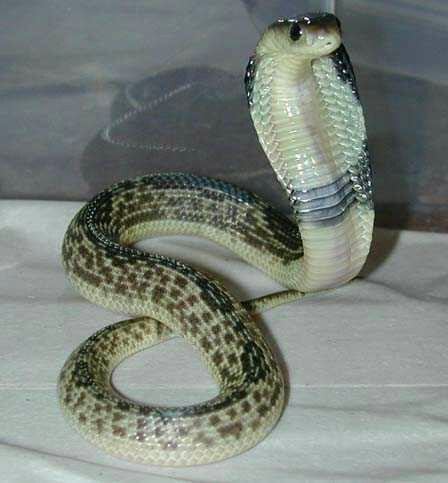 Even though the spitting cobras venom is not as powerful as the king cobra’s, the spitting cobra’s venom exhibits significant neurotoxic and hemotoxic effects. When the venom is sprayed onto its predators’ eyes, the snake is able to escape. When this venom gets in contact with the eyes, it causes a stinging sensation and gets completely absorbed by the blood vessels in the eyes. This causes irritation in the cornea, followed by tissue damage and will result in temporary blindness. This needs to be washed out as soon as possible to prevent permanent blindness. There are many species of spitting cobras, and the most common are the Naja nigricollis, Naja pallida, Naja siamensis, Naja nubiae, Naja ashei, and Naja mossambica. They vary not only in colour, but also size and patterns. For example, the Ringhal spitting cobra from South Africa and Mozambique are the smallest amongst the spitting cobra family. 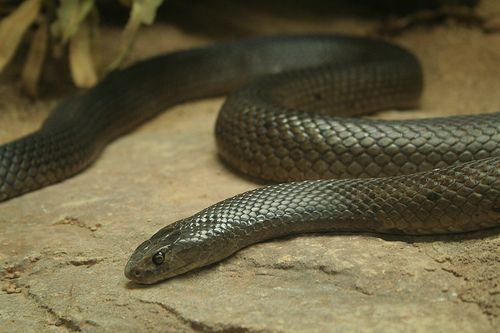 The banded spitting cobra has contrasting bands. Spitting cobras eat small rodents, lizards, and frogs. Their lifespan in the wild is about 20 years. They normally lay eggs beneath logs, termite nests, abandoned burrows, and other suitable nooks and crannies. However, don’t let their size and age fool you – the bite of baby spitting cobras can be just as dangerous as the adults! I never knew spitting cobras bites could kill!! yeah, me neither! that’s cool, if your not the bitten one! Spitting cobra’s venom can cause death and blindness? wiked!